My younger sister's New Year resolution was to try out a funky hair colour and with the blog world being set a light by the recent arrival of Bleach London Super Cool Colour's we thought what better place to start? After much deliberation she settled on Bleach London Bruised Violet Super Cool Colour which in my opinion is a cross between a deep crimson pink and your typical violet shade - out of the fairly expansive line up this is one of the deeper shades and as a result probably one of the best bets for naturally dark hair? As it is a year of hair experimentation for my sister (oh to be that brave again) she decided to pre-lighten her hair before application which we did using the Jerome Russell B Blonde Hair Lightener Kit which you can find via Boots for £5.99 - link. Basically this is an all over bleach bath of sorts to lift the natural colour out the hair so you have a light base to apply a tint on top off for optimal vibrancy. This is a step I do not recommend doing on your own - I have over processed my hair countless times in the past which has resulted in my hair snapping off so do approach with caution and don't guess the developing time what ever you do! Once blonde which was achieved really quickly (10 minute all over bleach) as my sister has a pixie like crop which was virgin hair we dried her hair and then set to applying Bleach London Bruised Violet Super Cool Colour to her entire head of hair. What surprised me most about the Super Cool Colours is that they smell really pleasant (more akin with a conditioner than a hair dye), they have a light liquid like consistency meaning it spreads really easily throughout the hair and a little goes a long way. I have long thick hair and would only buy two bottles to coat (and I mean coat) my entire head in the colour so the majority of users should find one bottle more than suffice. Unlike other colourants you apply the Super Cool Colours to freshly washed but towel dried hair (to soften the end result you can mix it half and half with conditioner or for an intense finish you can apply to dry hair) and simply rinse out once 15 minutes have passed. The end result? Truthfully? A little patchy. We followed the directions to the letter and yet certain areas of her hair have turned a bizarre lilac hue, with an area turning almost grey and others a deep crimson. I'm sure some will read this and say that various tones of purple adds dimension to the hair and normally I would agree but the truth is the end result looks a little haphazard. Basically my thoughts echo Caroline's post here - link, in photos Bruised Violet looks vibrant but in reality it is tricky and unpredictable so do approach with caution. 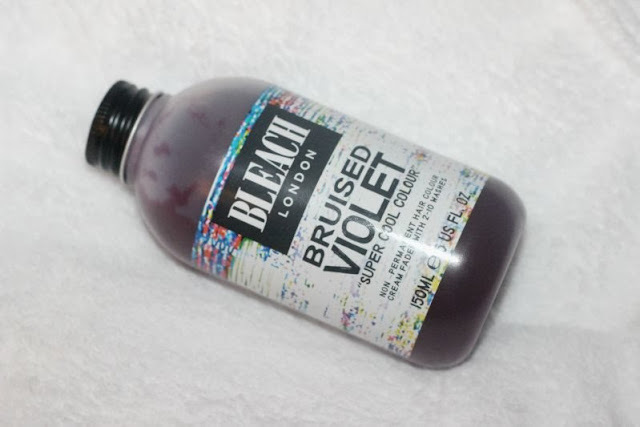 Basically if purchasing a Bleach London Super Cool Colour avoid the purple shades as they seem to be the most problematic! I think stuff like this is best used for like highlights of colour rather than all over, not because it looks better but mainly because if it goes wrong it doesn't really matter! The end colour shown in the pic does look nice but if it wasn't all like that, it'd be a bit weird! I also wish I was brave enough to go a little crazy with my hair, the biggest thing I've done is dyed it dark brown- and hated it! The time on most semi permanent unusual coloured dyes are for not long lasting colour. If you want long lasting colour with something like this you need to leave it on for much, much longer than 15 mins. I tend to leave mine on for upwards of an hour just to get a truly longer lasting and intense shade. I would recc Special Effects for your sister if you can get your hands on it. Great company, intense, long lasting colours, that fade beautifully too. That's a gorgeous colour but it's a shame about the patchyness, this really has put me off. nice colour shame about the patchiness Hun. I have heard that these can be a little patchy, great images to show each Step! Very helpful. I have very dark hair so can't really use these & see results but I would be worried about doing it t home & it looking awful. Maybe i'm not brave enough. I used this one and it was fab for about a week until it faded and stained my hair BLUE!! Traumatic times. I think these would be better for streaks or dip dyes maybe! They don't seem great for full head coverage. Color is just so iffy and sometimes it reacts weird due to the lightening process that was done before it (which is usually always neccessary). Oh well, better luck for her next time!! I've wanted to use one of these for ages but in a pink! Anyone have any ideas on how to combat this? I used the red shade on my blonde ombred hair in the Summer, and it lasted 2 washes... boo! I tried this on my ombre hair and after 2 washes went to turquoise/ greeny blue which stained my hair for 3 weeks till I got it professionally dyed! Such amazing changes! Wow the color is amazing! I always use Manic Panic for all my crazy funky hair colour jobs and am ALWAYS impressed. That stuff is amazeballs! I have tried loads of colours as well, blue, green, purple, red and always love it. Its a cream as well so doesn't drip everywhere. Would definitely recommended for your sister, i bet she could even get away with just putting it on top of the colour she has now. I usually leave it on for ages (like an hour) with a shower cap just for very vibrant colour and haven't had issues with stinging or damage. Then I mix some in with my conditioner to top up the colour as it fades. HIGLY recommended! I've been a fan of crazy colours for a while now - currently donning Schwarzkopfs Live Colour XXL in shade Rasperry Rebel. It came out dark purple at first but has faded wish washing to a really nice pink shade with my original platinum blonde peeking through - I think this is a great alternative to the Bleach London collection which i've heard nothing but bad press about! Shwarzkopf all the way! Wasn't to keen on violet skies however. Yet every one has different opinions I suppose but I regularly use bleach London on clients and genuinely am more pleased with them then other brands like crazy colour or directions. I have also reviewed this colour and done a youtube video.